This month, Wonderland BookSavers shipped 100 boxes of books, adding up to 5,000 total books, to Nigeria! This is our first shipment there, and we’re so excited to be able to make a contribution, thanks to our awesome liaison on the ground, Mark Grashow! The state of education in Nigeria is very dire, with more children out of school than anywhere else in the world; 40% of primary school-age kids do not ever attend school. Nigeria’s population growth over the last decade has made it even more difficult for the already struggling government to provide basic public services. This has especially impacted education, with about half of the current population under the age of 15. In many parts of Nigeria, there are simply not enough schools, and children often have to walk many miles to get there. Unfortunately, even where there are schools closer together, these schools frequently lack proper facilities such as a water-proof structure, toilets, books, basic school supplies and qualified teachers. Moreover, families often need children to go to work to help support their survival. In fact, perhaps one of the biggest factors is that families cannot afford to pay the required fees for uniforms and school books. Our hope is that we can provide some relief to schools and families by providing those needed books directly, so that the quality and possibility of education might be a little improved for some children. We are so grateful to try to do a little part to make sure that Nigerian children can get access to education which we so often take for granted! Packed by The Wonderland BookSaver Team! These books are all heading for South Africa, which has fairly strict importation guidelines. Every box must be accurately labeled and weighed. This was an excellent job for our treasurer and stellar statistician, Reid. As well as for our most junior member, Wills, who is just learning his numbers. Many pounds of books! I think we can count loading the truck as gym class today. Claire is managing to box books, load the truck, and attend her OHS classes! Finally our garage is (almost) empty, and it is (almost) Christmas. To be loved as to love. Merry Christmas to All, and to all, A Good Night! As summer comes to an end, many schools along the East Coast begin preparing for the new school year. This means clearing out their shelves. For us, at Wonderland BookSavers, this is an excellent time of year. We hopped in our Suburban and began visiting our favorite schools from Massachusetts to Connecticut. The Wetherbee School, in Massachusetts, has been especially generous. They truly understand the concept of charity. Working with their teachers, school children help to determine books, games and “manipulatives” as well as classroom posters and other tools that are no longer needed. Students then organize, prepare and box items for shipment to Africa. They are so excited and happy to know that they are actively helping other children. They compete for the opportunity to load our Suburban and take photos with us! As members of a Title I school, the children here are themselves frequent recipients of aid. Hailing from at least 35 countries, with many of the children describing rice and beans as their favorite food, these students eagerly share stories of daily life in America. Although it takes almost one year for their Pen Pal letters to make a round trip from Mbembeswana Primary School in Zimbabwe to Wetherbee School in Lawrence MA, they are thrilled that they can share their love of books, games and food with African children. We are so grateful to be the conduit for this truly snail-paced child-to-child mail system. Many other schools have been eager to help us in our mission to spread literacy. Librarians eagerly contact us as they prepare for the new school year. They are delighted that their favorite books will keep inspiring children. And we are happy to help them box and relocate their books from their libraries to our fabulous sorting area: our garage! Here we sort our books by age, subject, and intended destination, so that each region will get appropriate material. Some countries require us to weigh and quantify every box. Finally, we load our boxes onto trucks. From here they get loaded onto shipping containers and finally set off on their long journey across the sea, to another continent, 10,000 books, school supplies, pencils, crayons, and most importantly, 100’s of letters of encouragement from children just like themselves in America. The Wonderland BookSavers are grateful to have been able to connect so many children from across the continents and to inspire a shared love of reading, our tagline: Inspired by Literature! One day last summer, I went for what I thought was going to be a regular day of hanging out with my new friends Pierce, Brooks, Emma, Claire, and Maddie from my school, little did I know I’d end up crashing a Wonderland BookSavers meeting and boxing books in their garage and having an absolute blast!!! But besides having fun, I was mostly deeply inspired by their dedicated work to bring books and literature to those without. When I got in the car to go home, I told to my mom I’d felt like I’d been wasting so much of my life when I could have been really making a difference in the world. I am so inspired by my friends and since then I’ve tried to help in any way I can. My pastor likes to quote Sojourner Truth’s wise words that “Religion without humanity is very poor human stuff,” and for me it was really amazing to see my friends, my very same age, making such a direct and tangible difference for humanity. During the week, I live in Brooklyn, so I figured maybe I could help by reaching out to schools in my community there. Two amazing private schools in Brooklyn were just as inspired by Wonderland BookSavers and were eager to contribute. The first school to reach out to us was The Berkeley Carroll School. 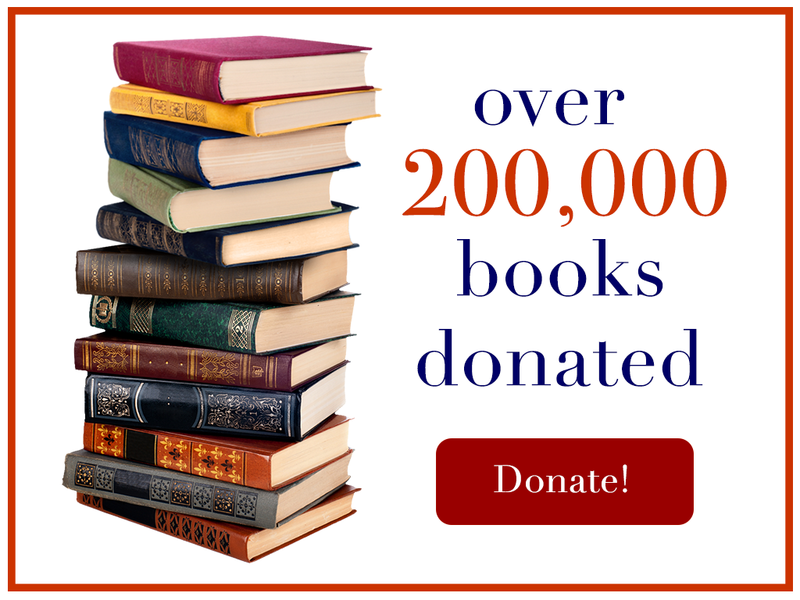 Berkeley Carroll has been so incredibly generous to the Wonderland BookSavers mission— Thank you Berkeley Carroll! The librarians there, Ms. Briar Suaro and Ms. Kristine Hartley-Maneri, have been so kind in reaching out whenever they have books to share and have donated some 50 boxes of books to date! The Brooklyn Friends School was also eager to contribute and offered us a great number of books as well. For the first pick-up, Ms. Ryan and I arranged to meet at the entrance where they could most easily unload the books on Pearl Street in downtown Brooklyn. Picking up books on one-way streets in Brooklyn can always be a little tricky — you usually have to block a little traffic but we try to do it quickly! — and Ms. Ryan warned us we’d have to do some slightly illegal maneuvering in order to get to the unloading spot. But as it turned out, we never had to worry about that because when we went to pick up the books that day we discovered a street fair! A two-block radius around Brooklyn Friends had been blocked off and filled with street vendors! Never daunted, the kind custodian of the school loaned me a dolly so that I could wheel the books down Willoughby Street to where my mom was waiting with the car on the other side. I wonder if those books will always have a faint kabob smell? Here we are re-boxing books into smaller boxes in Brooklyn before bringing them up to Connecticut to the Barry’s garage! We also live upstate on the weekends and so I started looking around up there for other opportunities to find books for Wonderland BookSavers too. We found two libraries that were willing to donate all the books they had left over after their annual book sale fundraisers. First we visited the Pawling library, who kindly gave us a generous stack of books (they will be able to give us even more this spring!) And then we visited the Patterson library. Ms. Graham at the Patterson Library so generously offered to donate all of the remainder children’s books from their library! Thank you Patterson Public Library! Finally, we brought the books to the Barry’s garage! Oh and that’s my sister Emmeline — she has been helping with all of the book moving and packing too and says “Wonderland BookSavers really is a Wonderland because it’s so fun and also kind-of like Magic.” I think she said it perfectly. A bookmark printed by the St. Francis Indian Mission in St. Francis, South Dakota has the following Indian prayer: “Great Spirit — Grant that I may not criticize my neighbor until I have walked a mile in his moccasins.” Hearsay attributes the prayer to Chief Joseph of the Nez Perce Indians. Before departing this earth, our children’s librarian, Susan Ei, encouraged us to create a Summer Service Day Camp where we could share our knowledge of the world with local kids, and create a fun learning environment that would spark both compassion and enthusiasm for others through literature and service. We decided to tackle this task by geographic region, and by thinking about the people to whom we most commonly donate. We wanted to be sure to include literature, crafts, games, education and a service project in each day’s meeting. Africa We began with Africa because we have donated so many books to multiple countries in Africa: South Africa, Zimbabwe, Uganda, Ghana, Kenya and Rwanda. We read Patience Mariza Goes for Water by Twesigye Jackson Kaguri, a native of Uganda, who has built a school for AIDS orphans in Uganda. This story, although a picture book for children, is very revealing. Patience is faced with unimaginable hardships that a storybook American child would never encounter. She is beaten by her aunt, and accosted by a strange man, worried she may have AIDS, and exhausted by her daily trek in search of clean water. Eventually, she is adopted by a kind grandmother. They also decorated donation boxes that they brought from home and filled with their own shoes so that they could share these with others. Haiti To begin our lesson on Haiti we read Tap-Tap by Karen Lynn Williams. This warm, funny story is about a girl who goes to the market with her mother and after making a little extra money she and her mother are able to ride the taxi-bus home (tap-tap) instead of walking. We know from our relationship with our friends at Haitian Education Initiatives, that a major part of Haitian children’s education is learning to make things they can sell in the market. Native Americans Having just returned from South Dakota, we had many stories and adventures to share. We also read Crazy Horse’s Vision by Joseph Bruchac and Black Elk’s Vision: A Lakota Story by S.D. Nelson. These stories told of the bravery and beauty of the American Indians as well as some of their beliefs and dreams. The Native Americans believe that Dream Catchers can catch bad dreams and spirits while you sleep and keep you safe. Our campers made Dream Catchers from found objects, feathers and beads. Food Lottery Each day, like every wholesome American Day Camp we had Snack Time. Who doesn’t? Well, many of the children we help don’t have snack time. We discussed this each day, and one day we decided it was time to emphasize what that might mean. Each child drew a piece of paper from a basket. Those with an X were given a snack. No X, No Snack. This was a pretty shocking moment, and after a while some pretty human responses occurred. Some kids “stole” some snacks. Some kids secretly “shared” their snacks with others. Some were publicly outraged, while they gobbled their own snacks. Politics as usual. Read to Feed We wanted to emphasize that reading is for everyone. We brought in a basket of books, the ones we usually donate, and had the campers choose their own books. Appalachia We have been donating books and building children’s libraries through Project Appalachia since 2012 so we are pretty committed to helping children in this region. We read Appalachia: The Voices of Sleeping Birds by Cynthia Rylant and Barry Moser. We also discussed other American communities that are in need of books and supplies. There are kids that need books and supplies that live in our own communities and we need to reach out and help them as well as helping kids that live far away. Our campers decorated boxes and brought them home to be filled with books that they could donate to children who would love to own their own books. Around the World and Banana Ball We also played many fun games, like an African version of soccer played with a ball made from banana leaves (although of course we didn’t have any real banana leaves) and “around the world” frisbee. Hospitalized children We always remember kids who are sick in hospitals. So we talked about illness and had the campers put together care packages of painted bags filled with our Knot-Yet-a-Blanket kits and poetry books. Lemonade for Literacy Our final project was to involve our campers, and our community, in our annual lemonade stand. Our Summer Service Camp jointly donated and boxed hundreds of shoes, books and school supplies, and created many Blanket Gift Bags. They had walked in handmade shoes, made dream catchers, fought over food, read stories from around the world, and committed to continue reading on their own. It’s time to create global literacy with lemons! A few months ago, we attended an event held at our local library, Pequot, where Sage, a Lakota Indian who lives on Rosebud Reservation in South Dakota, visited. He introduced us to his people’s culture with oral stories and native dances. Yet, despite this cheerful congregation, mission groups from two local churches, Southport Congregational and Trinity, told us of the crippling poverty rampant on the reservation. As education is frequently championed as a portal out of poverty, we decided to help by donating books to the children on South Dakotan reservations to facilitate their academic success, and to introduce them to the “magical awesomeness” of reading! To make the book donations even more meaningful, and to experience the living conditions of our books’ recipients, we packed up and caravanned to South Dakota. When we arrived in South Dakota, we were struck by the beauty of the landscape, enveloped by never-ending sky. However, the prairie was settled in many ramshackle homes and buildings, illustrating the poverty upon the reservation. After meeting with the group from Trinity, we brought the books into the Episcopal offices on the reservation. They are taking the boxes we donated, and are distributing the books to twenty different locations across the reservation. The mission group is building shelves in each community center, so that children all over the reservation, which is about the same size as Maryland, will have access to a library. Visiting Rosebud was an eye-opening experience. We witnessed the poverty of one of the areas to which we donate books, as well as the gratitude from the people involved. These in-person experiences continue to motivate our mission: to spread quality literature around the world, especially to those less fortunate. Next stop: Pine Ridge Reservation!